How could she leave me here? She knows I hate the sun. It so hot, I think my stuffing is melting. It’s been hours. I think she’s forgotten me. Feel myself getting weaker. What is that thing coming toward me? Shoo. Go away. I am a mighty voodoo doll and I will make your heart explode or your feet fall off or, what else was I supposed to be able to do? Oh, yes, I will make your speen rupture! That is what her father always says when he is lifting a water condenser or something heavy. So Jenel says that is one of my powers too. Making spleens rupture. Whew. It’s going away. Think pleasant thoughts, she’ll be here soon. Get your finger out of my eye, you clumsy oaf. Those buttons are very rare, thank you. Stop that, get your nose off of my head. Oh, my. What is this terrible creature? Why is it lying down and clutching me? That sure does feel nice. Oh, wait, ouch, squeezing me too hard. I can’t believe the things I have to go through for that girl. What is that smell? Beast! Wake up. I hear my girl Jenel. Get up, I tell you. I will rupture your innards this instant. They see the creature lying down curled up in a ball, near the watering hole. It’s large, even from this distance, its size is stunning. Tucked in its arms is the small voodoo doll. The most amazing thing is it has two heads, sitting on top of its wide and powerful chest. “Daddy, I see Jesque.” Jenel runs toward the creature heedless to any concerns except for her doll. “Jenel, stop!” He raises his rifle that he never leaves home without. Karis III was not a planet you traveled unarmed. Having lived here for many years, they were familiar with most of the animals but not all. This was something he had never seen. It’s movements were slow and deliberate. His finger hovered over the trigger. He hoped he was making the right decision. She is saying give me back you dolt. I belong to her. I knew she would come and get me. Release me this instant. It’s her father. He’ll fix this, right now. Yes, shoot this beast so I can come home. I have been out here all night. “So give their kin back and let’s go.” The giant turning over and rising slowly to its knees, hands the doll back to the girl, Jenel. I will not. Just look at them, two heads, scary eyes, rock-hard skin. And did you notice that smell? What’s there to be nice to? Letting go of the giant’s finger. She turns and runs back to her father. He hugs her and warily backs away. The giant gathers up its belongings, fills its water skin and sets off toward its home in the nearby mountains. About the Art: Joan Coleman is a diverse medium artist. Sketch, art, painting and fabric are all mediums she creates fantastic works of art. 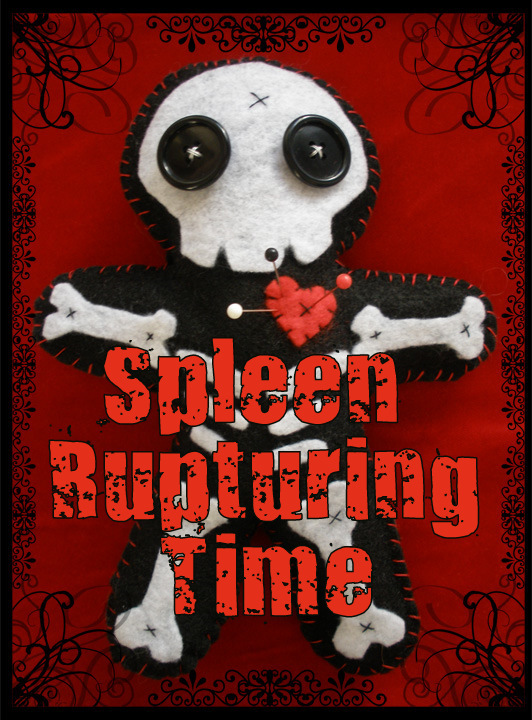 Her voodoo doll was perfect for the idea I had of reforming a voodoo doll from his ideas of spleen rupturing toward a kinder and gentler nature, and his ultimate failure. Amazing work, loved this short story.